MUMBAI: Bollywood stars often refer to the Hindi movie industry rooted in Mumbai as “one big family”, but the cracks in this large creative community are increasingly becoming too large to ignore, a report on BBC News said. 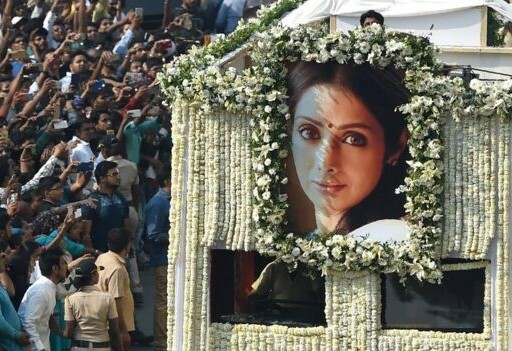 The tragic death of Sridevi has prompted an outpour on Indian social media over the pressures on the industry’s leading women and the murkiness behind their success. Along with that it has also exposed the plight of many hopefuls who pursue a path to Mumbai with dreams of making it big in Bollywood. The burden to defy age and look youthful and the haste to hide ugly scandals that embody campaigns such as #MeToo are not the issues of Hollywood alone. “Bollywood is probably worse with the history of its patriarchal mindset and the exploitative nature of young women more than men,” says a young Bollywood actor on condition of anonymity. Over the last two decades, gossip websites have been leaking information about romances, break-ups, problems with drink and substance abuse and criminal acts involving the industry’s stars. After it emerged that Sridevi’s death was due to “accidental drowning”, veteran Bollywood actress Simi Garewal tweeted about the “uncanny similarities in the death of #Sridevi and Whitney Houston”. Houston died in her hotel room on 11 February 2012 when she accidentally drowned due to the effects of cocaine use and heart disease, an autopsy concluded. A disturbing tally of at least 16 actresses and nine actors have taken their own lives in India, often reportedly due to being unable to bear the demands of the film industry, deal with heartbreaks or because of depression. Bollywood’s demands for big-ticket box office success, the pressure on its stars to appear visibly attractive and exposure to social media scrutiny have tested those at the top of the profession, too. Successful Indian actress Deepika Padukone has publicly admitted to suffering depression in this environment. Filmmaker Ram Gopal Varma, who directed Sridevi in Telugu language blockbusters, also spoke out on social media in an effort to convey how unhappy the Bollywood legend was in real life. “[Sridevi] went through so much in her life,” he said, adding: “Due to her early career entry as a child artiste, life never gave her time to grow up at a normal pace. “More than the external peace, her internal mental state was of a high degree of concern and this forced her to look at her own self. “The uncertainty of the future, the ugly turns and twists in her private life left deep scars in the superstar’s sensitive mind and thereafter she was never at peace,” Varma wrote on Facebook. Speaking to journalist Vir Sanghvi last year, Sridevi recalled how she had to acclimatise to the Bollywood way of working. She told him that while working in the south Indian film industry she would start shooting at 6 am, but in Mumbai she would wait for Bollywood actors to turn up on set well into the late afternoon, making her feel “restless”. She recalled how the promotions for her first movie in Bollywood “felt like a nightmare” and how she was “very, very uncomfortable” with the scrutiny of Bollywood’s paparazzi. Sridevi was called “Thunder Thighs” by the Bollywood press. For an entertainer who could speak fluently in five Indian languages, she was also mocked for her lack of English-speaking skills by the industry’s glossy magazines. Her death has also led to a lot of speculation about the effects of repeated cosmetic surgeries and the pressure on stars to look youthful. Sridevi had been quizzed on whether she ever went under the knife – it was always something she denied in her interviews. However, it is quite common in Bollywood for stars these days to undertake cosmetic surgery. In the past two decades, many young stars have spoken of how Bollywood has become an unfriendly place with incestuous power brokering among large studio houses. “I’ve been treated like a dog,” said Kangana Ranaut, India’s two-time national award winner and top Bollywood star. She spoke about how unfriendly and exploitative Bollywood is for hopefuls like her from small towns of India and how it has “scarred her psyche”. The current crop of Bollywood studio executives and filmmakers is different. Successful, rich and powerful, they are predominantly the children of former stars and film producers. The breed of second and third generation “star kids” are urbane, educated in schools abroad and are often called the “Bombay yuppies” in Bollywood. The many hopefuls who call themselves “outsiders” without the protective network of powerful families or former star parents are vulnerable to greater exploitation, according to Ranaut. Industry stars and film producers openly heckled Ranaut and her comments led to debates on the entitlement among Bollywood’s current crop who have the patronage of big studios and their family money. The outsiders who have become successful, including Shah Rukh Khan, Anushka Sharma, Ranveer Singh and Deepika Padukone, have the firm backing of the traditional studios and filmmakers. Debating these difficult issues that the industry faces has been muted in Bollywood and in the public sphere. Sridevi’s tragic end has led to introspection of how Bollywood’s beauty should be more than skin deep. Stop Copying Articles from BBC..